Of course life was not like that back in the Middle Ages. Anytime you wanted to hear music, you had to make it yourself, or find someone who could make it for you. While working on The Lost Castle Treasure, my second novel for middle readers, I needed to learn something about music and musical instruments during medieval times. To help me out, Ron Braley, a medieval and Renaissance music enthusiast and lute player, has graciously agreed to answer a few questions for us. It is a stringed musical instrument, beautiful both in sound and appearance, that became the stuff of myths. The lute was often meant only for the ears of noble people like kings and queens. Imagine a teardrop-shaped guitar, but instead of a flat back, the lute has a deep, rounded back, almost like the hull of a boat or the curved dome of a shell. Instead of having a guitar’s round sound hole on the front, a lute has a carved area called the rose. Where did it come from? How long has it been around? The lute began as an ancient Arabic instrument. In fact, its name evolved from the Arabic al-ud, which means “the wood.” The ud came to Europe after the crusades and grew into the European lute probably in the 14th century after being played for nearly 1,000 years in the Middle East and Asia. How important was the lute in music during the Middle Ages? The lute was the stringed musical instrument of the times. It was portable and very useful for singing ballads, dancing, and worshipping at church. Smaller lutes were playable by nearly anyone. Larger lutes were more difficult to play and, therefore, mastered by fewer medieval musicians. Musical notations of beautiful lute songs written during this age have survived for hundreds of years and can still be played today (pictured right). Do any medieval lutes still exist today? Several ancient lutes do exist; some can be seen in museums. At least one has been restored and used by Jakob Lindberg to record later medieval music recently. Can you tell us about any myths or mysteries about the lute? The lute was believed to possess magical healing powers, and its beautiful sounds were said to sooth even the most troubled soul. 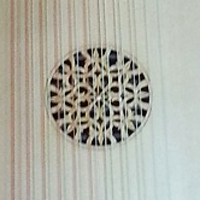 The intricately-carved rose covering the sound hole (pictured left) was thought to aid healing. This came at a time when about half of Europe’s population was dying of bubonic plague. A common misconception at the time was that flowers could help cure someone who was infected. The lute’s rose, as a flower, represented that possible healing power. The printed music for lutes looks different than typical music notation. What are those differences and how do they apply to the lute? 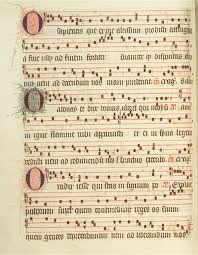 Medieval and modern music notation consists of dots or diamond-like shapes and stems representing a particular tone on a musical scale. A singer or player needs to understand not only how to read those symbols but how the next notes should sound. Lute music notation is called tablature (pictured below). Instead of dots representing a tone, lute tablature tells a player where to put his fingers to make notes or chords. It uses numbers or letters to represent a particular fret or finger. This makes the playing of an instrument like the lute where there may be several places on the fret board to play the same tone much easier and precise. Can you tell us about some famous lute players? A lute player is called a lutenist. Many, many people wrote music for the lute, although not all of them actually played the instrument! Johann Sebastian Bach loved the lute and wrote music for it, but he didn’t play. One of the most famous lute players from the medieval period was John Dowland. He was an Englishman who played for the King of Denmark until James the 1st allowed him to join his court as a royal lutenist shortly before John died. An air of mystery surrounded Mr. Dowland, as he was rumored to have been a spy for England! How did you become involved with the lute? Where do you play? I heard a recording of baroque lute music in 1992 while in England, and instantly fell in love with the sounds of the lute and the music itself. After some investigation, I found a lute I could use to start playing late-medieval music and began my long journey as a lutenist. My first lute-playing job was at a mall in Mississippi in 1993 and I continue to play whenever and wherever I can. I’ve played recently at Star Co. Coffee and Water-2-Wine in Round Rock and will play for a friend’s wedding soon. My wife, Joanne, has a beautiful voice and often joins me in performing lute-voice songs. Many thanks to Ron Braley for sharing his knowledge and love of the lute with us! Love all of your research! !